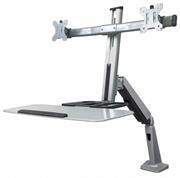 Improve posture and work comfortably while sitting or standing with the Manhattan Universal Sit/Stand Workstation Mount. This desk mount features a full-motion system that offers a wide range of movement, allowing perfect customized viewing and working positions. 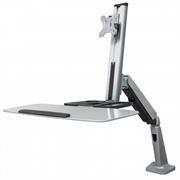 Improve posture and work comfortably while sitting or standing with the Manhattan Universal Sit/Stand Workstation Mount. 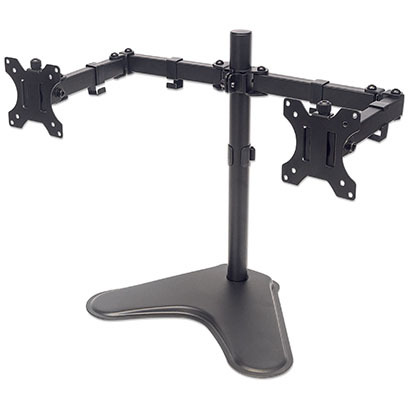 This desk mount features a full motion system that offers a wide range of movement, allowing perfect customized viewing and working positions. LCD-monitor installation above the desk helps maximize the effectiveness of a potential workspace. 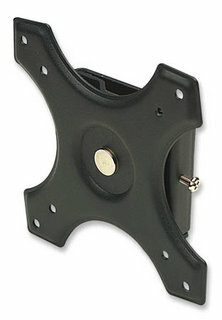 The Manhattan Universal Four Monitor Mount with Double-Link Swing Arms improves organization on the desktop, making it easier to get work done on the computer. Constructed from durable die-cast metal, this four monitor mount features a sturdy clamp that allows for quick, easy and secure mounting without the need to drill holes into desks or countertops. Its fully adjustable tilt, rotate, side-to-side, height and tension settings create the perfect position to comfortably increase productivity. Such adjustment capabilities can even help reduce eye fatigue or neck and back strain. In addition, the mount pole offers easy monitor rotation to allow others to view presentations and multimedia productions from almost any direction. 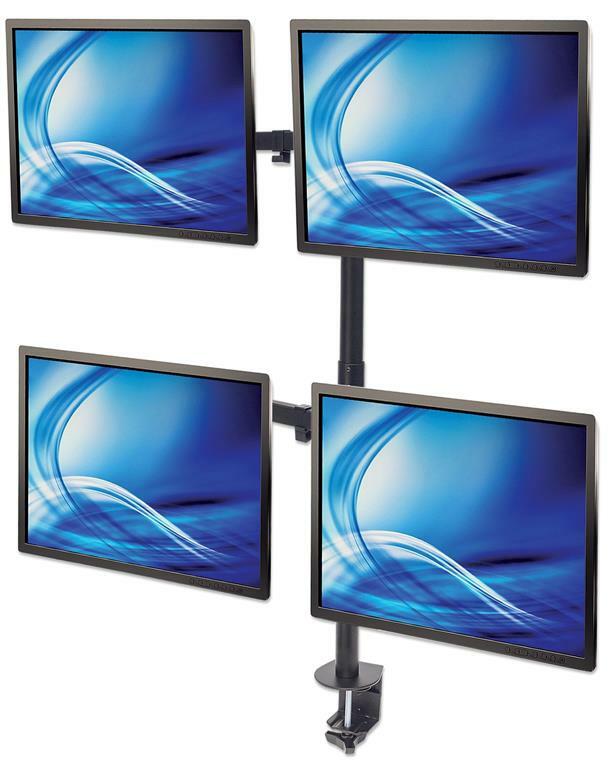 • Meets VESA standards — securely holds four LCD monitors from 13” to 32"
Manhattan Universal Desktop Counterbalance Monitor Stand - Free Standing, Gas-Spring Adjustable, Includes Two Pass-Through USB Ports for 13" to 27" Monitors, Retail Box, Limited Lifetime Warranty. The Manhattan Universal Desktop Counterbalance Monitor Stand is a perfect monitor arm for those who cannot or do not want to clamp a mount to their desk. Its gas spring enables the user to easily move their monitor to a more comfortable viewing angle with the lightest touch. Two USB 3.0 pass-through ports are built into the base for greater accessibility, enabling more user choice in connecting to a PC, notebook or wall chargers. 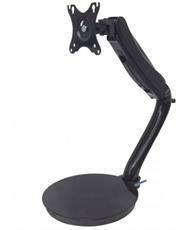 LCD monitor arms help utilize work space, improve ergonomics and share views. 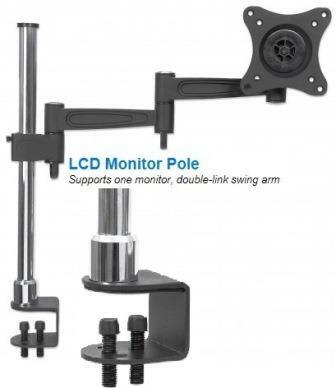 The MANHATTAN LCD Monitor Pole with Double-Link Swing Arm provides a secure and elevated position for two flat-screen monitors to help free up valuable desk and work space. Its fully adjustable tilt, rotate, side-to-side, height and tension settings enable a comfortable and productive viewing position that helps reduce eye fatigue and neck and back strain. 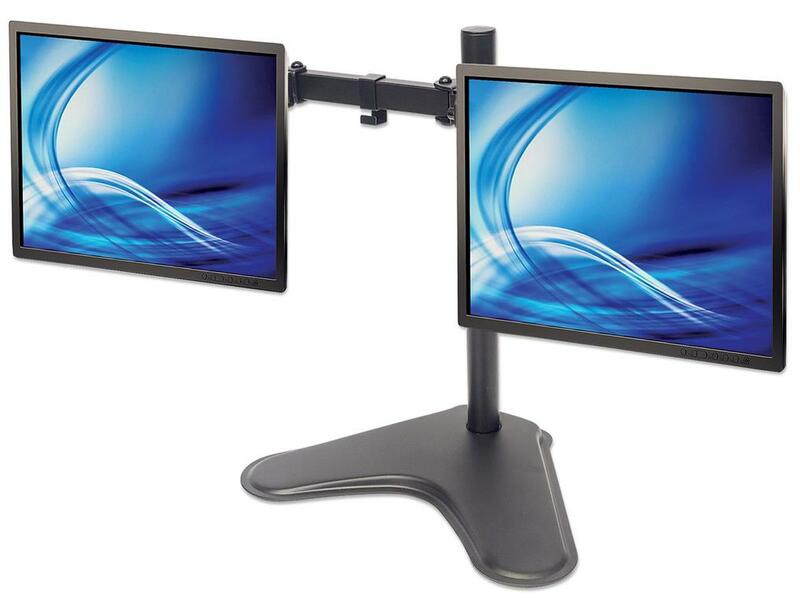 LCD monitors can be easily rotated around the pole to allow others to view presentations and other multimedia displays from almost any direction. Durable die-cast aluminum construction and a sturdy clamp provide a quick, easy and secure mount to a desktop or other horizontal surface. VESA compliant and ready to install with included hardware, there's no need to drill holes into desks or countertops. Strict manufacturing standards ensure the highest quality in all MANHATTAN products. All items carry a full Lifetime Warranty — the strongest quality commitment anyone can make. LCD-monitor installation above the desk helps maximize the effectiveness of a potential workspace. The Manhattan Universal Dual Monitor Stand with Double-Link Swing Arms improves organization on the desktop, making it easier to get work done on the computer. Constructed from durable steel, this dual monitor stand features a sturdy base that allows for quick, easy and secure mounting without the need to drill holes into desks or countertops. Its fully adjustable tilt, rotate, side-to-side, height and tension settings create the perfect position to comfortably increase productivity. Such adjustment capabilities can even help reduce eye fatigue or neck and back strain. 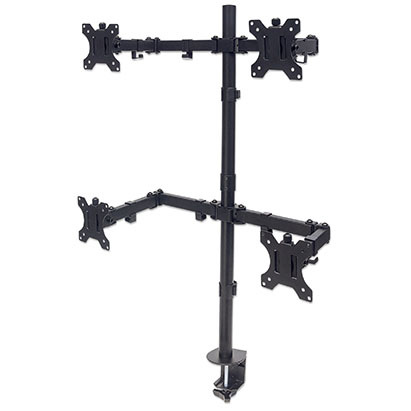 In addition, the mount pole offers easy monitor rotation to allow others to view presentations and multimedia productions from almost any direction. 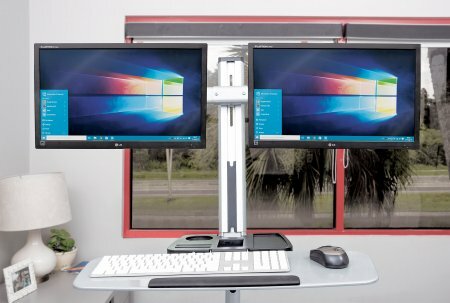 • Meets VESA standards — securely holds two LCD monitors from 13” to 32"
LCD monitor poles help utilize work space, improve ergonomics and share views. 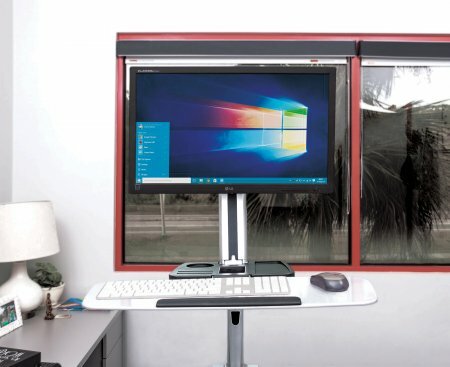 The Manhattan LCD Monitor Pole with double-link swing arm provides a secure and elevated position for a single flat-panel display to help keep valuable desk and work space free and uncluttered. Its fully adjustable tilt, rotate, side-to-side, height and tension settings enable a comfortable and productive viewing position that helps decrease eye fatigue and reduce neck and back strain for improved productivity. The LCD display can be easily rotated around the pole to allow others to view it from almost any direction. 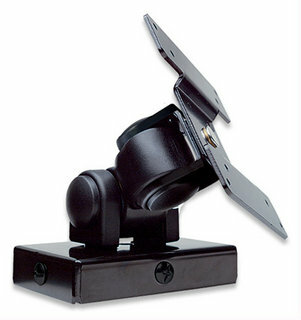 Durable construction and a sturdy clamp provide a quick, easy and secure mount to a desktop or other horizontal surface. VESA compliant and ready to install with included hardware, there's no need to drill holes into desks or countertops to bring better views front and centre. Fits 75 x 75 mm / 100 x 100 mm VESA-compliant monitors up to 22"
The MANHATTAN LCD Wall Mount provides a secure and elevated position for a single flat-panel display to help keep valuable desk and work space free and uncluttered. Durable die-cast aluminum construction and two-piece bracket provide a quick, easy and secure mount to most vertical surfaces. 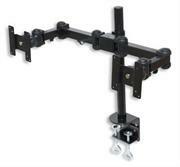 VESA compliant and ready to install with included hardware.